Leveraging its prime location and magnificent views of important campus icons and restorative natural landscape enables Kansas Union to become a vibrant social and intellectual center. New openings to the west façade provide visual connections to the view from Mt. Oread, the highest point in Kansas, overcome the circulation challenges of the existing six-story structure, and provide sun-filled student gathering environments. 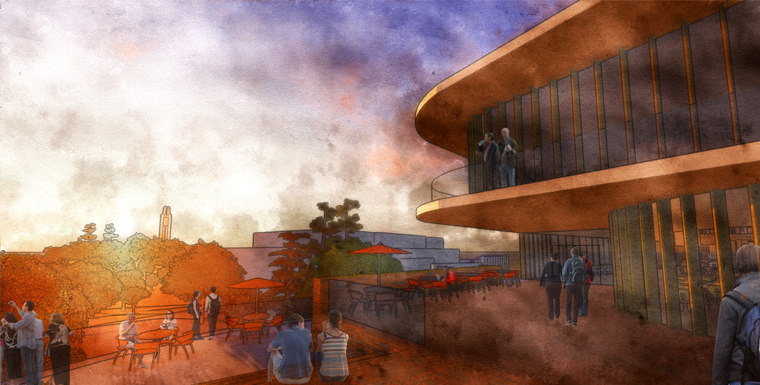 A "Birds Nest" connects the entry/coffee house level to the dining lounge below, with stadium seating providing an environment for casual programming and a place for students to gather and watch the Jayhawks. Student involvement, leadership, and multicultural spaces are strategically located to enhance visibility and increase serendipitous encounters. Located at the end of Jayhawk Boulevard, a revitalized community-facing entrance plaza and outdoor cafe welcomes visitors and provides a meeting place for students to begin their day on campus or plan a night out in downtown Lawrence. Chairs and tables beneath retractable awnings and bosques of native trees add shade, scale, and comfort. 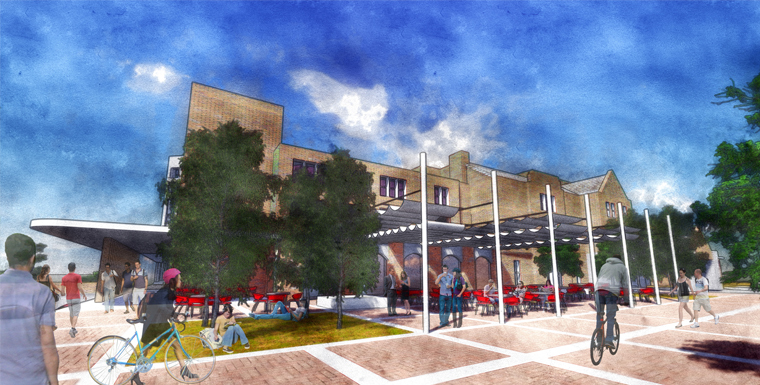 A series of outdoor terraces surround the Union, creating an experiential path connecting upper and lower campus and strengthening inside-out connections between the Union and the campus.